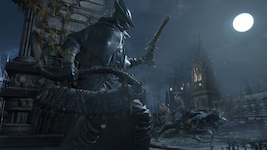 Saw Cleaver is a Trick Weapon in Bloodborne. "One of the trick weapons of the workshop, commonly used in the hunting business. The saw, with its set of blood-letting teeth, has become a symbol of the hunt, and only grows in effectiveness the more grotesquely transformed the beast." This particular weapon transforms between a saw and an extended cleaver. It's classified as Serrated while wielded in the saw form. It can be acquired as a gift from the Messengers the first time you visit the Hunter's Dream. The Saw Cleaver is one of two choices for a strength weapon when you are first starting off with a new character. It's also the only starter weapon that has a waning gem slot for its normal form. This weapon is a jack-of-all-trades in terms of combat, and is highly versitile against either single opponents or a mob. The normal mode (saw form) is useful when dueling a single opponent. It utilizes very fast attacks that do not take alot of stamina. However, it has a short reach and is difficult to use against mobs. When transformed, it takes the appearance of an extended cleaver. This form has superior range and several attacks that can strike whole mobs at once. Like the normal form, it's wielded in one hand at all times. Keep in mind that this form also suffers a decrease in attack speed when compared to the normal form. Furthermore, remember that only the saw form deals extra damage against enemies vulnerable to serrated attacks. The follow up R2 after a fully charged R2 can knock some enemies down while the cleaver is extended. This trick weapon and the Saw Spear differs mainly by transformed move sets and STR/SKL scaling. The Saw Cleaver has superior strength scaling and deals serrated damage in saw form only. The Saw Spear has superior skill scaling and also deals serrated damage while in both forms. Results from testing on an unarmored level 120 character with a +10 Saw Cleaver with no gems. Numbers are rounded to the nearest 100th. Quickstep R1 0.95x 27 The character steps forward quickly and slashes from left to right for all quicksteps except to the right. For that step the slash is from right to left. Dash R1 1.09x 30 (+run) The weapon is brought from left to right and somewhat downward. Very short range but the character takes a leaping step forward. R2 Attack 1.20x 35 The weapon is brought back behind the character and after a short delay, brought from right to left in a quick slashing motion. A big step with the right foot is taken to help close the distance to enemies. Charged 1.90x 50 Very similar to the R2 attack but with a longer windup (but a relatively short windup for a charge attack). The attack still goes from right to left, but on a diagonal rather than horizontal path. Leap 1.40x 50 (+run) The player jumps forward a short distance and raises the weapon overhead, bringing it down to attack during the landing. This attack nearly sweeps the ground. Transform Attack 1.30x 23 (+x) This attack appears like it would hit twice, but only provides one hit. The character brings the closed weapon forward into a punch and it extends to strike while out in front of you. The damage is caused by the weapon opening. Due to a fairly short range during transformation, this is best used with a quickstep toward your enemy. Quickstep 0.95x 30 The character steps forward quickly and slashes from right to left if moving forward, backward or right. While stepping to the left, the blade is brought from left to right. Backstep R1 0.95x 25 This looks very similar to the quickstep animation moving forward or right but the attack arc is narrower. That is, it's a right to left slash, but shorter. Dash R2 1.20x 45 (+run) The dashing R2 is nearly identical to the standing one. The Saw Cleaver is the Trick Weapon featured on the title screen. It was also one of the first weapons to be revealed for this game. Overall the mechanisms of this weapon didn't change at all, starting all the way back when Bloodborne was still known as "Project Beast." According to the concept art, the Saw Cleaver uses a trigger mechanism to unlock the joint during transformation. The transformed cleaver shows a resemblance to LB-66 MOONLIGHT from Armored Core V.
The Japanese name is written as "nokogiri nata" (ノコギリ鉈) or "saw hatchet". Nokogiri is a traditional Japanese saw that cuts from the pull stroke, as opposed to the more common push stroke. In real life, there is a type of cleaver known as a mezzaluna ("half moon") cleaver, known for chopping/mincing up various food products. Most of these types of cleavers have handles on both ends. However, some use a single handle that stretches across the blade, which was used to chop up herbs usually; the saw cleaver follows this particular model. Coincidentally, the Strength/Skill/Arcane scaling at maximum level is "CDC" in their respective order. The CDC is an American organization designed to combat and prevent "health threats" of varying natures. Since the beast scourge acts like a plague (and is spread due to blood-related reasons), those who wield the Saw Cleaver can be thought of as fighting a dangerous epidemic. 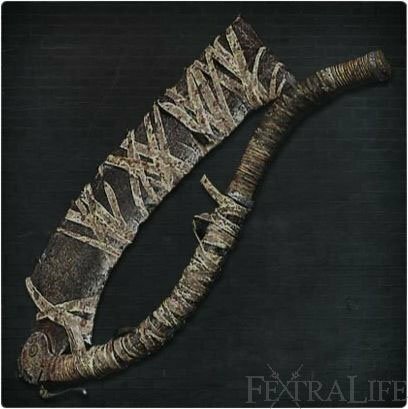 Henryk uses this weapon when he fights you and Eileen the Crow during her questline, as well as when he is summoned by you when using the Old Hunter Bell. Found easy Lost Saw Cleaver in Fetid/Rotted Lower Pthumeru Chalice before first Lantern in side area. Glyph is 5irzfnzq. This is basically BBs version of the longsword. Works well for everything in the game, but not necessarily the best at anything other than r1 spam. I love the Saw Cleaver. I feel like the attack descriptions on this wiki need a severe makeover. Instead of writing a paragraph describing each combo, there should really be a simple list of attack types, velocities, ranges, and where the combo loops. Maybe something like this? : TRANSFORMED R1 (ATK Type): Reg, [Reg, Thr...] (Velocity): Diag, [Ver, Thr...] (Range): Med (Brackets indicate which portion of the combo is repeated. Ellipses denote that the combo can be continued.) ...This isn’t describing an actual weapon in the game, but Saw Cleaver’s moveset isn’t complex enough to show what I mean. Would this be less confusing for users? or should we stick to paragraphs? Can be modified as needed, or include special info with use of an asterisk. Is it true that this does more damage against beasts? Some people say it&apos;s the best weapon in the game. I think while it (and the Saw Spear, its apples or oranges.) have unmatched DPS, which is why the speedrunners run it obviously, I think it&apos;s a bit overrated by some myself. NOT saying it&apos;s bad because obviously it&apos;s not, it&apos;s crazy good; but some people make it out to be like there&apos;s no point to using anything else. It&apos;s good but its moveset is pretty straightforward too, which I guess is a big draw for some people but I actually think certain other weapons have an easier time against certain monsters, and it&apos;s really an all or nothing weapon in PvP if you can ever get that. 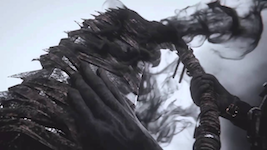 So in other words, the cover art weapon of Bloodborne will take you anywhere with its DPS and ease of use, but when all is said and done it&apos;s a pretty simple weapon which can be a bonus or a detriment depending on the person and situation. Set some fire blood gems in this baby. With a decent arcane build this weapon is nasty. So you ever think about how the Saw Cleaver is just an oversized, serrated straight razor, literally used for "cutting through beast hide?" And how barbers in the 19th century worked alongside doctors as bloodletting surgeons, believing that the removal of tainted blood was the most reliable cure for disease? In Nightmare frontier you can get cursed droplets from lanterns, up to 11% pdmg or so. any know where to get a good physical% gem to put in its 3rd sloot early game? (waning gem slot) I am already at "the one reborn" and haven&apos;t find a better gem that the one I get from Gascoigne daughter. It&apos;s the balder side sword of Bloodborne. Except better in every way. Found an uncanny saw cleaver when creating a random chalice while waiting for my friend.I&apos;ll keep it up and active for any new players and characters interestedGlyph: dyh2ky2aHost: SandraWhere: Layer 2 pre-boss bonus roomAren&apos;t these weapons supposed to be rare? I found at least one on every dungeon so far. Found a lost saw cleaver and an uncanny rifle spear on my first ever sinister, that i create for fun and pvp!I&apos;ll keep it up and active for any new players and characters interestedGlyph: 6di5przmHost: Edward Edgy McWhere: Layer 1 pre-boss bonus roomAlso: Uncanny Rifle Spear on layer 2 pre-boss bonus room.It&apos;s a SINISTER Lower Pthumeru, so make sure you can join sinister dungeons before joining.If you cant, just create any dungeon with sinister rites and it will unlock. I can&apos;t speak for myself, but word is that people are feeling like the Saw Cleaver has a hidden damage modifier of some sort, as the weapon especially late game seems to do a lot more damage than its on-paper stats would suggest, with or without gems. Could be something unintentional, or maybe it&apos;s just people&apos;s imaginations but this is a sentiment I&apos;ve seen from more than one person. Is it viable as an end game weapon? Because I want to keep this beauty as a my main for as long as possible.